If you’re someone who likes a clean, fresh, low calorie drink, and wants to reduce their carbon footprint, look no further. The SodaStream Genesis sparkling water and soda machine will be your new best friend. I recently had the privilege to review this product. Let me tell you, I am a picky one for taste, and one for watching her calories. So when I poured my first drink and took that test sip, I was very happy with what I found. The installation was quick and easy and took under five minutes, even for me. I rarely have the patience to put anything together. The instructions were written out in simple format and also had picture diagrams. After the set up, it took mere seconds to fill the bottle included in the kit and press the easy to reach button on the top to carbonate the water. The flavour bottles come in easy to hold containers and instructions on the side. One capful poured into the water, a gentle shake, and it’s done. That simple. From set up to the first drink, it took about ten minutes. I tried the Orange Grapefruit flavour, at 35 calories per cap full. It had a nice clean, crisp flavour. If you wanted just a hint of flavour in your water or something a little stronger, I am sure you can adjust the amount you put into the water bottle. The water is best when chilled, as it states in the instructions. I was curious to try it right away, so I just put in a few ice cubes and it tasted fantastic. The recyclable and resealable bottle is now chilling in my fridge, waiting for the next use. I can not say how the other flavours taste, but there are many to choose from. They range from colas to ice teas, to fruit drinks to green teas. The Genesis machine is sleek and not bulky, and takes up very little room on my counter. The bottles are fantastic to take on the go. The replacement parts are easy to order on their website along with over dozens and dozens of flavours to choose from. They range in price from $6.99CAD and up. The machine itself is listed as $129.99 on their website. You can also find the SodaStream machines and accessories in Walmart. I’ve been debating on this purchase as I have a friend who’s been using a similar product for awhile now. I feel a bit sheepish admitting this but I had no idea that you could buy various flavors lol This makes the thought of investing even more intriguing as I’d hate to buy something just to have us not use it…like you, I’m rather picky on flavor. I love this thing thanks for the great review. I’ve been curious about this product. Have you tried their version of Dr. Pepper? I wonder if it’s any good. The Dr Pepper version is called Dr Pete. I’ve used the diet Dr Pete and the taste is a very good copy. The key to the best taste with the sodastream is measuring the syrup. Put too much in or too little and it will not taste right. The cap on the bottles of syrup have lines etched in them showing the amount of syrup for 500ml and 1Ltr. If you measure to the lines the taste is perfect. Also, the colder the water the better. If your a picky person and you liked this one then I probably will too. I do like the color and the stream line design of it. I been wanting one of these since before Christmas but I guess Santa couldnt afford another one. I hear the various flavors are good. I want one of these bad. I saw all the flavors, and am floored!!! With a selection like they have, why buy pop?! I have not been able to make up my mind about purchasing a Sodastream machine. My husband drinks alot of soda and this would be much more healthy. Thanks for the review! I’ve been wondering about these machines. Thsnks for the review ! I have been thinking about getting one! I have been wanting one of these for a long time now. We had one of these when they first came out years ago. At that time, they only had a few different flavors. Our three Children loved to “help” make their own drinks. We no longer have that machine and have even discussed getting a new one. I am excited to learn there are more flavors to try, even green tea! We may have to get a new Soda Stream! I got one of these and I am very pleased with it. I’ve found I had to use a little more carbonation in the diet drinks and they taste great! I would love to try one of these, I think my kids would love it. These seem like an nice alternative to the marked up retail carbonated drinks. And it gives you some control on strength of flavor. 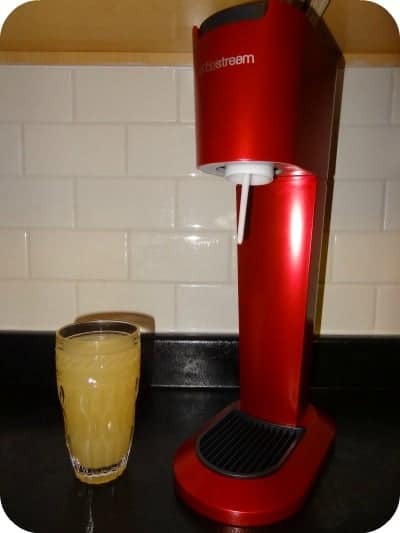 A good investment for anyone who really enjoys their juice with some bubbles! 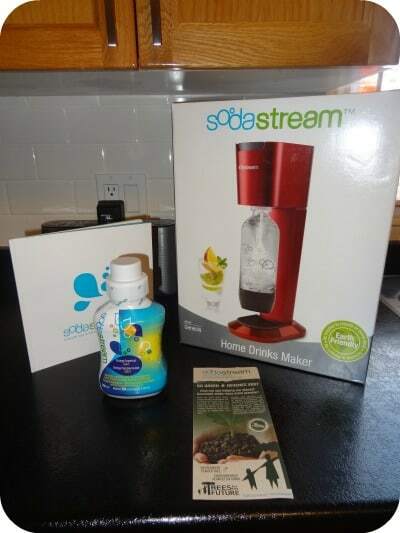 I always debated on whether to buy a SodaStream .My boyfriend and kids really want one. I was hesitant because I thought it might have a fake syrupy taste to it. I might have to buy since you said the taste was good.